As reform decentralization and local governance affect the area of ​​culture? What are the challenges facing cultural institutions on the ground? As such reform was carried out in Poland and what lessons cultural institutions cleared after 10 years of operation in decentralized communities? As cultural institutions can find their place in the reform efforts and to outline ways of further development? 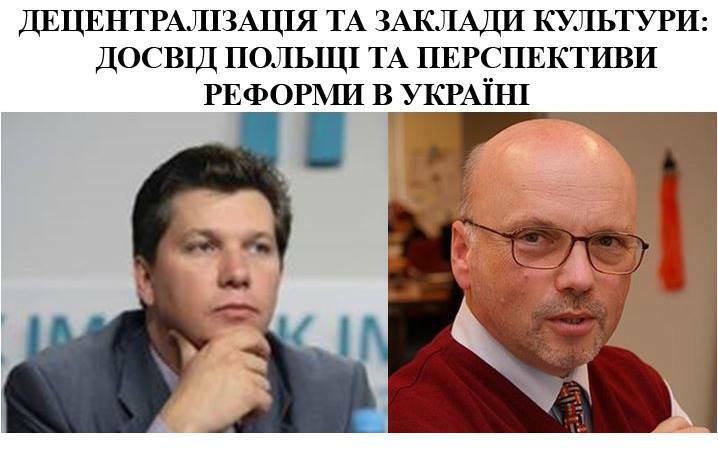 In response to numerous requests, we continue to discuss key reforms in the country and their impact on local communities in the “Hour of experts.” On peculiarities of decentralization of cultural institutions will talk to international experts and the Ministry of Culture of Ukraine on November 24 and US House, from 17:00 to 18:00. Rostislav Karandeev – Deputy Minister of Culture of Ukraine. Jacek Voynarovska – program director of the Institute for Public Policy (Warsaw, Poland), Advisor to the Minister of Administration and digital technologies. The event will strimytys online. During the discussion you may address your questions to the speakers of the event. To join the webinar event mode, click http://bit.ly/1PeYntG 30 minutes prior to the event and follow the instructions on the screen. The question now accepted – please leave your question in the comments to this post, and speakers are ready to give answers to them. Free entrance. To get to the building of the American home, be sure to carry a passport or driving license.